A North Somerset gymnast who helped Team GB women finish fifth in the all-round competition has announced her retirement. Ruby Harrold showed poise and strength during her uneven bars routine, but has decided to finish her career as an elite gymnast in favour of university. The 20-year-old, who trains at Portishead, will head to Louisiana State University this September - a move she has put off for three years. 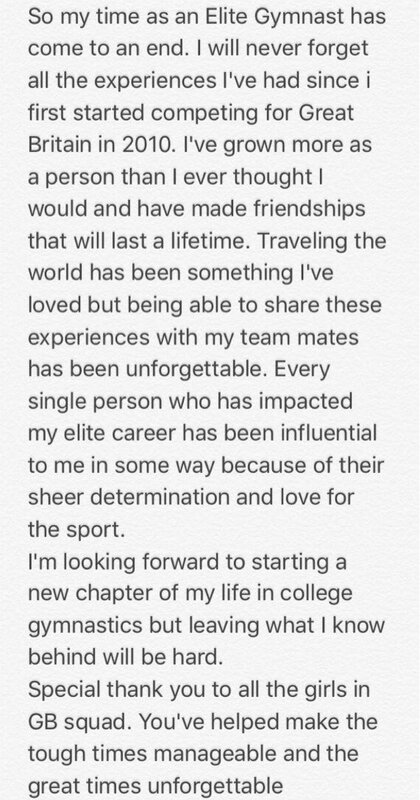 I'm looking forward to starting a new chapter in my life in college gymnastics, but leaving what I know behind will be hard. Special thankyou to all the girls in the GB squad. You've helped make the tough times manageable and the great times unforgettable. 20-year-old Ruby is a seasoned performer. At the 2016 British Championships she won beam and bars bronze before going to Bern for the European Championships and helping the team take silver. A victory parade will be held for double Olympic Gold Medallist Helen Glover in her home town of Penzance. An open-topped victory bus will take to the town's streets on September 4. The former student at Humphry Davy School will be accompanied by the school's band as well as local sporting figures, close friends and family. The bus will depart Newlyn Quarry at 1.30pm and will make its way through town to the Harbour Car Park where the Town Mayor, Cllr Mike Lovegrove, and the Headteacher of Humphry Davy School, Bill Marshall, will greet the parade. Penzance is very proud of Helen and her amazing achievement in gaining another gold medal in the 2016 Olympics to sit alongside her medal from the 2012 Olympics. On behalf of the Town Council and all the people of Penzance -congratulations Helen and we are looking forward to welcoming you back to your home town in true Cornish style! Rio celebrations have come to end - but we look back at the Olympic Games with fond memories and huge amount of medals in tow. Following a crash at the Olympics yesterday BMX rider Liam Phillips has been discharged from hospital under medical supervision. British taekwondo fighter Aaron Cook, who's originally from Dorset, is representing Moldova at the Rio Olympics. Olympic champion Charlotte Dujardin has arrived home after winning gold in the dressage in Rio.